This military history of the Republic of Turkey is the history of the armed forces established under the Republic of Turkey, beginning with the Turkish War of Independence. The Liberation of Izmir in 1922 effectively sealed the Turkish victory and ended the Turkish War of Independence. The Turkish revolutionaries rejected the Treaty of Sèvres (1920), which had left the Ottoman government in control of substantially less of Anatolia than modern Turkey controls. Following the victory of Atatürk's forces in the War of Independence, the Treaty of Sèvres was substituted with the Treaty of Lausanne (1923), which granted international recognition to the government of Ankara, rather than the Ottoman government in Istanbul. In 1938, the Turkish Army at peacetime strength consisted of 174,000 soldiers and 20,000 officers forming 11 army corps, 23 divisions, one armoured brigade, 3 cavalry brigades and 7 frontier commands. Like most nations at the time it was ill-equipped with primarily World War I era weapons. The rifles used were a mixture including Mausers, Mannlichers, Lee–Enfields, Martinis, Lebels and others. As late as February 1940, the British Foreign Office noted: "The Turkish Army is very short of rifles and has asked us to supply 150,000." The Turkish Air Force had 131 first line aircraft in 1937, of which only half were relatively modern. Turkey hoped to increase the size of its fleet to 300 by 1938. Although Turkey had 300 trained pilots, the majority of them would be rated with moderate ability to fly in bad weather in a Western European Air Force. In 1942, Ernest Phillips in his work Hitler's last Hope: A factual survey of the Middle East warzone and Turkey's vital strategic position admitted: "If the Germans were to stage an all out offensive in this area, they could bring more planes into the air than the Turks could even gather, and if we were to send too many from Libya to help Turkey, the weakness there would be such that we should be in difficulties on the other side of the Suez." At the beginning of World War II the Turkish Air Force consisted of some 370 aircraft of all types, 450 pilots and 8,000 men. During the war Turkey sent pilots to Great Britain for training purposes. 14 are known to have died in Great Britain. One of them was shot down by a German plane during a training flight in British air space, the rest died in accidents. The daughter of former Air Forces Commander Emin Alpkaya, who had been sent to Britain for training during the war, stated she found something amazing while examining her father's wartime diaries. He wrote that "they have told me that I am ready to go to Berlin. I have returned from the bombardment at 6 in the morning. I was tired". There were some allegations that Turkish pilots, who had been in Britain to get training during World War II, joined missions which bombed Berlin. However officials of the Turkish General Staff asserted that their pilots were never assigned in active aerial warfare and bombing flights. Alpkaya may have been referring to a ride along in a plane manned by an allied crew, in which he took on the role of observer, and not a combat role. The Turkish fleet in Malta, in 1936, prior to World War II. The Navy was the weakest of the three armed services at the outbreak of war. The Turkish Navy was the weakest of the services. It consisted of the outdated battle cruiser Yavuz (ex-Goeben), 4 destroyers, 5-6 submarines, 2 light cruisers, 3 mine-sweepers, 2 gunboats, 3 motor torpedo boats, 4 minelayers and a surveying vessel. The personnel strength was approximately 800 officers and 4,000 men. The Navy lacked all modern appliances for defending coasts and harbours, and the ships were defenceless against air attacks. During the Anglo-Turkish Treaty negotiations in September 1939 a military credit agreement amounting to £25 million was agreed upon. A Turkish Ministry of Defence letter to the Turkish General Staff dating 22.03.1940 stated that the Turkish Army was to be increased to 1.3 million effectives forming 14 army corps consisting of 41 infantry and 3 cavalry divisions, 7 fortified positions and one armoured brigade. Yet, the letter stated, "the material resources of the nation were unable to provide for the provisioning and transport of this large number of effectives". Turkish MG08 team on the minaret of the Hagia Sophia Museum, 1941. World War II broke out in the first year of the İsmet İnönü presidency, and both the Allies and the Axis started to put pressure on Inönü to bring Turkey into the war on their respective sides. The Germans sent Franz von Papen to Ankara, while Winston Churchill secretly met with Inönü inside a train wagon near Adana on January 30, 1943. Inönü later met with Franklin D. Roosevelt and Winston Churchill at the Second Cairo Conference on December 4–6, 1943. Turkey remained neutral until the final stages of World War II and tried to maintain an equal distance between both the Axis and the Allies until February 1945, when Turkey entered the war on the side of the Allies against Germany and Japan. Until 1941, both Roosevelt and Churchill thought that continued Turkish neutrality would serve the interests of the Allies by blocking the Axis from reaching the strategic oil reserves of the Middle East. But the early victories of the Axis up to the end of 1942 caused Roosevelt and Churchill to re-evaluate a possible Turkish participation in the war on the side of the Allies. Turkey had maintained a decently-sized Army and Air Force throughout the war, and Churchill wanted the Turks to open a new front in the Balkans. Roosevelt, on the other hand, still believed that a Turkish attack would be too risky. Inönü knew very well the hardships which his country had suffered during 11 years of incessant war between 1911 and 1922 and was determined to keep Turkey out of another war as long as he could. Inönü also wanted assurances on financial and military aid for Turkey, as well as a guarantee that the United States and the United Kingdom would stand beside Turkey in case of a Soviet invasion of the Turkish Straits after the war. In April 1944, Turkey halted its sales of Chromite to Germany, and broke off relations in August. Turkey declared war on the Axis powers in February, 1945, after the Allies made its invitation to the inaugural meeting of the United Nations (along with the invitations of several other nations) conditional on full belligerency. No Turkish troops ever saw combat. 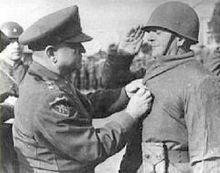 The commander of the Turkish Brigade, Tahsin Yazıcı receiving a Silver Star during the Korean War. During the Cold War, Turkey participated in the Korean War as a member state of the United Nations, suffering 731 deaths in combat. The fear of a Soviet invasion and Stalin's unconcealed desire to control the Turkish Straits eventually led Turkey to give up its principle of neutrality in foreign relations and join NATO on February 18, 1952. Following NATO membership, Turkey initiated a comprehensive modernization program for its Armed Forces. In July 1974, the Turkish Armed Forces intervened against a coup in Cyprus, organized by EOKA-B and led by Nikos Sampson who ousted the democratically elected Cypriot President Archbishop Makarios III in order to establish Enosis (Union) between Greece and Cyprus. The coup was backed by the Greek military junta in Athens. On 20 July 1974 the Turkish Army invaded the island from the north, landing in Pente Mili beach, near Keryneia. The operations (named Attila I and II) lasted until August and resulted in 37% of Cyprus territory coming under Turkish military control. Turkey still maintains troops in Cyprus, since a political solution could not yet be achieved, and since many members of the Turkish Cypriot community fear a return to the intercommunal violence which occurred between 1963 and 1974. Turkey's armed forces participated in the NATO-led military intervention and no-fly zone in Libya against Muammar Gaddafi's government troops. The Turkish Navy participated with five ships and one submarine in the NATO-led naval blockade to enforce the arms embargo. It additionally provided six F-16 Fighting Falcon jets for aerial operations. On 24 March 2011, Turkey's parliament approved Turkish participation in military operations in Libya, including enforcing the NFZ in Libya. The airbases committed were Incirlik and İzmir. Six batteries of the NATO-backed, MIM-104 Patriot missile defense systems have been set up to protect Turkey against aerial incursions from war-torn Syria. ^ a b Douglas Arthur Howard: The history of Turkey, Greenwood Publishing Group, 2001, ISBN 0313307083, page 111. ^ a b c d e f Selim Deringil: Turkish Foreign Policy During the Second World War: An 'Active' Neutrality, Cambridge University Press, 2004, ISBN 9780521523295, page 33. ^ Ernest Phillips, Hitler's last Hope: A factual survey of the Middle East warzone and Turkey's vital strategic position, 1942, page 54. ^ William Green, John Fricker: The air forces of the world: their history, development, and present strength, Macdonald, 1958, page 281. ^ a b Turkish pilots never assigned in bombardment flights during World War II, The Free Library, October 23, 2009. ^ İngiltere'de şehit düşen subayların sırrı Archived 2012-02-03 at the Wayback Machine, Aksiyon, Erkan Car, 9 August 2004. ^ Bombardımanda Türk pilotları, Hürriyet, 22.10.2009. ^ The Americana Annual, Americana Corporation, 1941, page 281. (University of California, digitalized July 2010). ^ The World almanac and book of facts, Mark S. Hoffman, Press Pub. Co. (The New York World), 1946, page 371. ^ a b Deringil, 2004, pg 38. ^ Deringil, 2004, page 39. This page was last edited on 23 January 2019, at 23:55 (UTC).